Madras Cafe started a new venture and opened up a gourmet food store earlier in 2017. Wondering what’s on its shelves? We’ll tell you. Madras Café, the age-old breakfast joint in Matunga whose food we love, has diversified operations. The owner’s sons, Devrath and Jaiprakash Kamath , has just begun a new business. 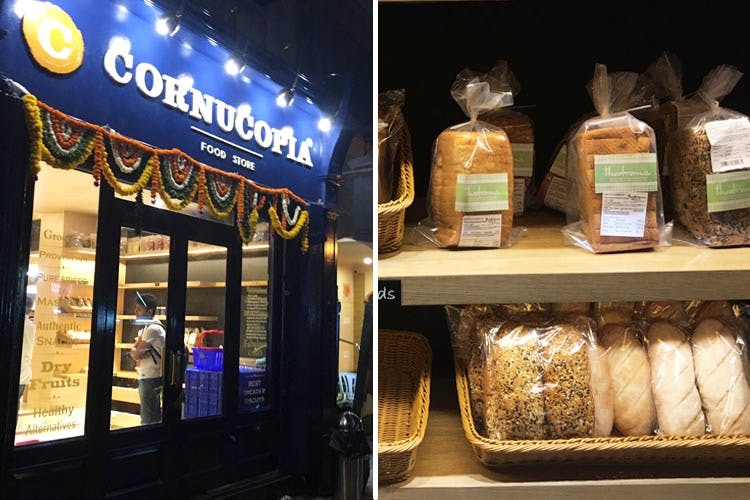 Cornucopia is a sweet little blue shop just around the corner from Matunga circle. There are jams and preserves – watermelon and rose, green apple and kiwi, and fresh bread by Theobroma. Devrath enthusiastically recommends his favourite, the Parsi bread with chutney in it. The fresh food counter comes as a surprise – delicious, hot Asian soupserved in a cup that you can take away or packed dishes including zucchini rolls, soba noodle and tofu chilli, sandwiches, pita pockets and even fresh juices. Each item is lovingly and mindfully chosen and is something that the owners would keep inside their own kitchen. While the packed meals are prepared by different home chefs across Mumbai, including a Parsi aunty, the mozzarella cheese is made by someone in Haryana, the garlic, green chilli and sweet potato papad by people in a village in Karnataka and the bread from Theobroma. The shop opens at 7 am and stays up till 10pm. Soon, they will even begin delivery at home. Find supermarkets intimidating and very, very confusing? Cornucopia has just the right amount of things, that will make your shopping experience even more fun. Also, don’t forget to try the soup.